AT&T Office@Hand AT&T Office@Hand uses cloud-based technology, eliminating the need for expensive hardware, complex installation, and technical expertise traditionally required for a business phone system. 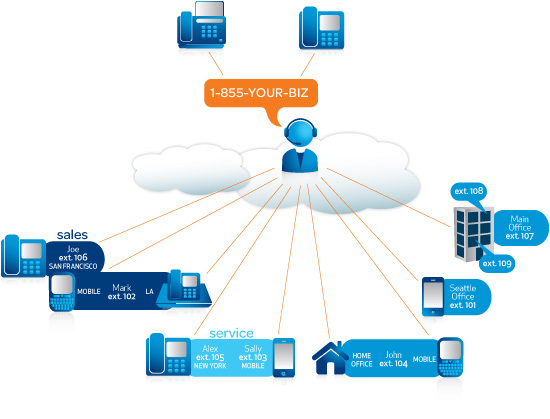 Activate your business phone system instantly online or from select smartphones and start taking calls in no time. • Choose a local or toll-free business number, or transfer your existing number. • Use the auto-receptionist to direct calls to virtually any phone number, employee, or department in the U.S.
• Add Digitallines with VOIP phones or Softphones. • Give employees their own direct-dial local number and extension that forwards calls to their existing wireless or desk phones. • Create departments with direct-dial extensions for groups like billing, sales, or customer service. • Receive and send faxes without a fax machine.